Melania Trump has found herself in the center of one wild conspiracy theory. Recently, the First Lady appeared on the White House lawn alongside President Donald Trump. 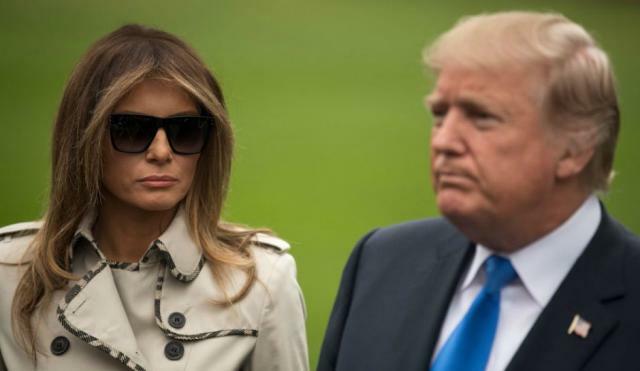 As her husband spoke to reporters, Melania stood to the side nodding her head while wearing sunglasses and a trench coat. Andrea Wagner Barton watched the speech and thought something was a little off. What came next was a conspiracy theory that has caught the attention of social media and the Internet as a whole. "Will the real Melania please stand up?" the comedian asked her Facebook followers. "Is it me or during his speech today a decoy 'stood in' for Melania??" She added, "And....Why would the moron say 'my wife, Melania, who happens to be right here...' Seriously, watch very closely!" Ultimately, the post that features video and photos of the First Lady with and without sunglasses on has been shared more than 108,000 times. And if that wasn't enough, Americans are creating a wide variety of gifs, memes and posts of their own. Don't believe us? Just take a look at a few below. Despite the rumors and theories, pictures of Melania at Friday's event without sunglasses on makes it pretty clear that there isn't a body double. And for those wondering, both Donald and his wife have not commented or tweeted about the theory sweeping the World Wide Web.